Parsley in Time has launched its range of festive champagne flutes, just in time to add a touch of sparkle to caterers’ Christmas plans. To make it even better, there’s a 15% discount on all orders before the 31st of December 2018. Flutes are the ideal way of serving champagne. The stem helps to stop your hands from warming the drink, and the bowl is tapered inwards, helping to both preserve the bubbles and concentrating the aroma of the champagne. 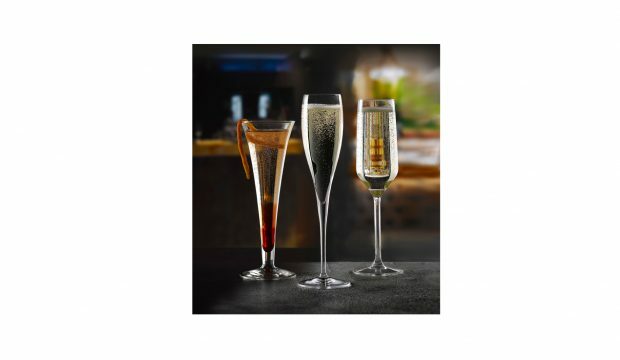 The range of flutes comes in a variety of beautiful designs which are made from top quality glass or crystal. For real fizz fans there are special nucleated flutes to enhance the production of bubbles. No matter what kind of Christmas mood a venue is creating for its customers, Parsley in Time has a flute design that will enhance it. For example, the Vinoteque Super flute is made with beautiful clear crystal glass and has a stylish tulip shaped bowl. Alternatively, the Magister flute has a more traditional form with a classic cylindrical bowl. Parsley in Time’s champagne flutes for Christmas 2018 have list prices starting from £2.67 per glass, which equates to £2.27 per glass after the 15% discount is applied.